This is a guide to the UEFA Futsal EURO 2018 (30 Jan – 10 Feb) to help you enjoy the championships and assist you with your score predictions on FutsalPredictor.com where you can enter for free to win some fantastic futsal prizes, and play leagues with your community (e.g. friends, club). I will cover all the teams below and follow FutsalPredictor on YouTube, Facebook, Twitter and Instagram to get analysis and exclusive insights throughout the tournament with myself and Sam Matterface. Slovenia have a group of strong, technical players that are dubbed the ‘Golden Generation’ and are at their peak. They have home factor that took nearby Croatia and Serbia to their best performances and the 3rd Place Playoffs in 2012 and 2014 respectively. They rely on a small core group and nearly all are semi-professionals which means they can tire towards the end of games. Last time round they took leads against both Serbia (who they also played in the championship opening game) and Portugal before losing by four goals. We might see them employ the fly goalkeeper early in games to lower the intensity and give a rest bite to key players. A positive for them is they don’t play back to back games, as in 2016, allowing that crucial extra recovery time. They have only one win at the championships but that was against the eventual champions Italy in 2014, highlighting their potential. With the team at their peak and home support, this is their time to shine. Their record goalscorer and captain is a warrior with lots of experience as this is his fourth Euro. He has lots of responsibility on his shoulders and will rarely be taken off to rest. This is a rejuvenated squad since we last saw them at a major championships, crashing out to Egypt in the last World Cup. They have brought some younger players in but there is a surprising omission for Sporting Lisbon’s Rodolfo Fortino who has been a key player for them in recent years. In 2014 they started badly, losing to Slovenia, and went on to win it. In 2016 they were arguably the best team in the group stages but lost in the first knockout round to debutants Kazakhstan. So it is difficult to read too much into their early performances. They have a difficult group but they defeated both their opponents in back to back friendlies in the last year so you would expect them to make it out. If so, they will likely face one of the favourites in Russia or Kazakhstan again in the quarter finals where they will have to be on their best form to make it into the last four. Very skilful individual that likes to go 1v1 on the left wing where he attracts defenders, leaving spaces for others to exploit. Serbia come into this tournament from the high of achieving their best ever performance when they came 4th as hosts. They were very entertaining, relying on winning their individual battles in attack and defence. However, two of their three key players will be suspended for the first game in Marko Peric and goalkeeper Miodrag Aksentijević. With groups of three teams they can’t afford to not get a result in their first game especially when their second is against Italy. They have a new coach after 9 years in Goran Ivančić and it will be interesting to see if he has improved their set plays as this was a big weakness for them last time in both attack and defence. Their main man last time when he scored 5 goals, two of which were with that toe punt technique that is common in futsal. A great 1v1 dribbler. Russia is a team that continually falls at the last hurdle, having been runners-up for the last 3 Euros and the last World Cup. Brazilian born pivot Eder Lima has been the key man and he got an amazing 10 goals and 8 assists in 7 games in the last World Cup. However, this also shows their reliance on him and his partnership with fellow naturalised Brazilian Robinho. In fact, the pair scored 60% of Russia’s goals in qualifying. In the final of the World Cup Argentina were able to nullify Lima’s threat by pressing and cutting his supply, effective due to the lack of mobility in the team to exit the pressure. One way they have tried to lighten the load on Lima is by adding another Brazilian born pivot in FC Barcelona’s Esquerdinha who was playing in Russia until recently. They also have an excellent defence, incredibly not conceding in qualifying. If they top their group, no guarantee with Kazakhstan there, they will likely face Spain in the semi final whom they beat at the same stage in the World Cup. If they do that again they will have to again answer the question of whether they can perform in a game where a title is on the line. I have gone for Chishkala because he adds intensity to the team and creates goals from stealing possession high up the court. To those unfamiliar with international futsal they might expect Kazakhstan to be an outsider but, in my opinion, they are one of the favourites alongside Russia and Spain. They have some talented local players but they have also applied the questionable player development strategy of giving Brazilians citizenship as have several others at the championships. One of those is goalkeeper Higuita, named after the Colombian football goalkeeper who was also excellent with his feet. They disrupt the rhythm of games and allow key players to recover by bringing him into the attacking half as the fly goalkeeper. This tactic gets all the attention but their success is also built on a disciplined zonal defence that is difficult to break down which is credit to coach Cacau. If they can avoid injuries and suspensions to the small number of players they use as happened last time they have a great chance to make it to the final and possibly becoming champions. Scored in the last edition but not only is he very adept with his feet but also a fantastic shot stopper. Qualification is a great achievement for the country as they have only been here once before back in 2001. On the way to the finals they drew with Spain, the first team to take points off them in qualifiers since 2004, and narrowly beat Hungary in the playoffs. Coach Błażej Korczyński faced criticism for selecting young players ahead of more experienced ones but their qualification has proved he put his faith was well placed. Despite having a very young team there is lots of talent and potential among the squad. They are unlikely to get out the group where they face the teams who finished runners up and 3rd last time but, even if they don’t, we are sure to see more from this exciting squad in the future. Captain and a proven goalscorer who likes to shoot early. This is a chance to demonstrate his talent on the international stage. This is a team that features record breaking 5 time Umbro Best Player of the World Ricardinho. They have always heavily relied on the iconic winger alongside pivot Cardinal but the latter is injured with his replacement Tunha inexperienced at international level. This puts more responsibility on the shoulders of the 1.65m tall star. This is not something that will faze him and he will be determined to achieve success with Portugal as it is the only thing missing from his illustrious career. In fact, their best performance came in 2010 as runners-up when he missed the finals through injury. He is 32 now and with next major championships in three years time, it will only become more difficult for him to deliver Portugal’s first ever trophy. To put so much responsibility on one player, even a genius like him, is unfair as futsal is a team game and his compatriots must be on peak form and offer an alternative attacking threat. They seem to have now decided on Bebe as their number 1, after unsuccessfully changing their starting goalkeeper halfway through the last Euro, and he is rewarding them with reassuring displays. They have a relatively straightforward group which should give them the opportunity to find their form going into the knockout stages. At the last tournament he delivered what has to be the best goal ever scored in the history of the sport and was truly transcendent. Since he won the Golden Ball on his debut at this tournament in 2007 he has always delivered spectacular moments. Ukraine consistently get out of their group but, for the last four tournaments, have fell immediately at the quarter final stage. The same occurred at the last World Cup. This trend could be related to their low risk and direct style where defence takes priority. They don’t send numbers forward in attack and ensure possession is short before going forward to protect against the counter. This way of playing gives consistent results against the weaker sides but you must risk more to beat the more established nations. They are built on a team ethic with no individual standing out above the others and usually substituting four for four. In qualifying they scored 7 goals from 7 different players highlighting that responsibility is shared throughout the squad. A likely quarter final against defending champions Spain means that recent history could be repeated. A very skillful player and one of the few Ukraine players that likes to go 1v1. They didn’t qualify in 2016 but reached the quarter finals in 2012 and 2014 so they have several players with experience of the championships. They are another of the nations that has added Brazilian born players to strengthen their squad. They are an attractive team to watch as they use the 4-0 attacking system which requires lots of off the ball movement and intricate play. They are comfortable in possession and, especially against Ukraine, will see lots of the ball. Certainly will be competitive in both their group games. One of their Brazilian players who got 6 goals in 9 games in the qualifying stage. The left footer will need to be on goalscoring form for Romania to get results. Spain comfortably won last time and were a level above the other nations. Head Coach Venancio has the luxury of strength in depth that none of his peers have. The 2016 Golden Shoe winner from FC Barcelona Mario Rivillos has not made the squad and nor has Benfica’s Raul Campos who was their top scorer in qualifying. Last time most their goals came from their full court press and set plays. It was this rather than their ability on the ball that differentiated them. The former is supported by the fact they have so much depth to maintain the intensity throughout games and expect to see virtually the every outfield player involved throughout matches. It will be interesting to see how much influence their tournament debutants have in the skilfull Joselito, the precocious Adolfo and pivot Solano, who takes the role Fernandao previously had. This complements the experience they have in captain Ortiz, 2004 World Cup winner Paco Sedano, Pola, Lin and Migueling. They will likely face Russia in the semi-finals who beat them 6-2 at the same stage in the World Cup. That time it was injuries and suspensions that cost them and they have brought Alex and Sergio Lozano, who hadn’t played for Spain since injuring his knee at the World Cup until being recalled, who are still recovering from recent injuries. They are certainly favourites if they have all their resources at their disposal. The 38 year old FC Barcelona stopper was recently voted Umbro Best Goalkeeper of the World for the first time. In the final stages having such a consistent performer in goal will be key. They have reappointed Brazilian coach Alesio for their 5th consecutive Euro. He left in 2014 after 6 years and was the assistant coach for Kazakhstan in the last championships when they took bronze. They feature 5 Brazilian born players and 9 playing in the same club so they know each other well and will be competitive. They always provide entertainment, having been involved in the highest scoring game at the championships for the last 3 editions and were the highest goal scorers in the qualifiers. Alesio is a fan of the fly goalkeeper and we may see him use that against Spain to disrupt their rhythm. They will be confident they can make it to the knockout rounds but it is unlikely they will match or supersede their debut performance in 2010. An attacking player with excellent skills. Scored two hat-tricks at the last World Cup but unfortunately one of those featured two own goals. As debutants and the lowest ranked team in the championships there might not be a lot of expected of them. However, this is a nation where futsal is really taking hold and their progress has been built on a league whose level is rising quickly. They have a squad of quick and technical players. For this reason they use a 4-0 attacking system with no target man but instead focusing on forward runs to give depth. They play Spain first where I expect them to sit deep and try to absorb pressure before counter attacking. 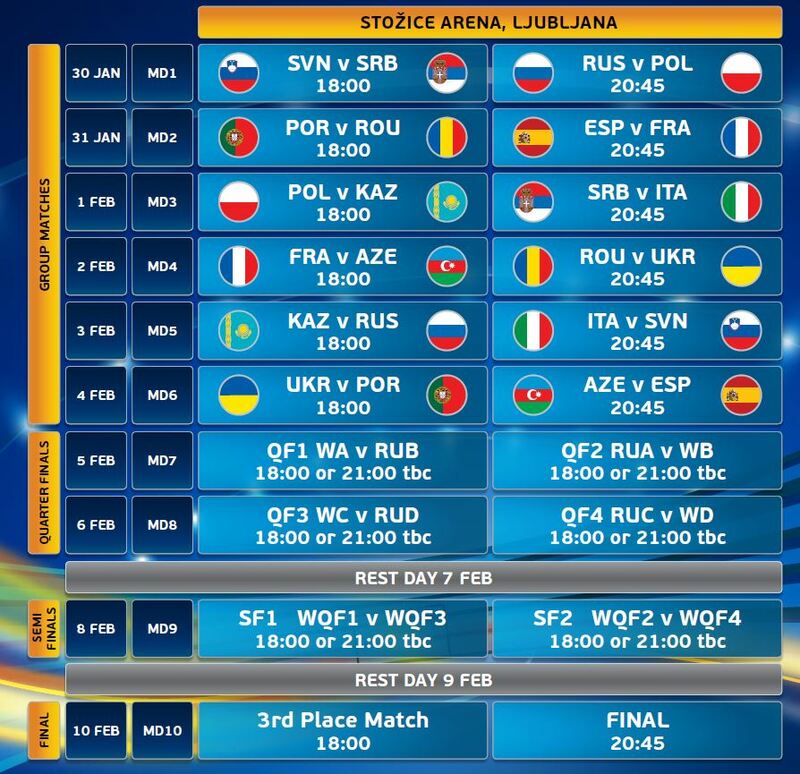 The Azerbaijan game will be key for them if they are to qualify and I expect their defence to be much more aggressivel and higher up the court. Azerbaijan struggled against pressing last time around. Could be a high scoring game. If they do make it to the quarter final it will be quite the achievement from this rapidly developing futsal nation. He provides a real goalscoring threat with 6 goals in 7 games in qualifying. I expect them to keep him on court as much as possible. 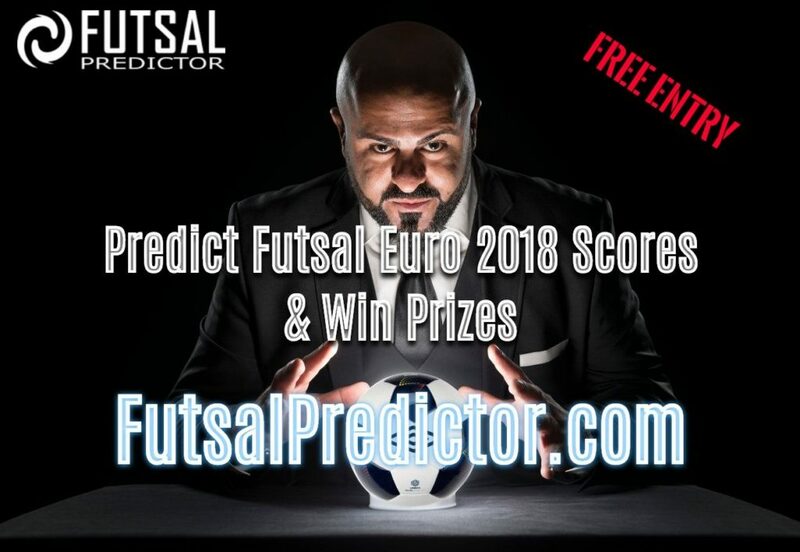 I hope this guide has given you some insight into the teams and will help you with your FutsalPredictor.com predictions which can win you fantastic Umbro futsal gear. You can also see 4 experts and myself on the website to help guide your predictions. Remember you can create your own leagues with your friends or club to create a fun atmosphere around the event. Leading up to the tournament and throughout myself and leading sports broadcaster Sam Matterface will be providing analysis and commentary on all the action. You can follow this at Futsal Predictor’s social media channels (YouTube, Facebook, Twitter, Instagram) and send us your predictions or questions. Will Spain reign supreme again or could Kazakhstan provide a shock? Which game will provide the surprise in the group stages? And what magic has Ricardinho got in store for us this time? We’ll soon find out! TV: UEFA.tv will show games live in countries where no broadcasting rights have been bought including in the UK.